A lot can change in the UAE in a year: new neighbourhoods can spring up, road networks expand so quickly that Google maps is always behind, and game-changing cleantech and sustainability plans that keep us on our toes can be announced over night! After the recent announcements by the Supreme Council of Energy in Dubai of incentives for buying electric and hybrid vehicles, the next question is: is the EV charging infrastructure even in place in Dubai (and the UAE) to support the intended influx of EVs? The UAE has had charging station infrastructure for a couple of years. Installations began in Dubai by Dubai Electricity Water Authority (DEWA) in 2015 after its Green Charger Initiative was announced in 2014 with a target of 100 stations. That target has since been reached through a partnership with Green Parking. This was to support the government’s aim to lower carbon emissions by 16% by 2021. In Abu Dhabi charging stations have been built by Abu Dhabi National Oil Company (ADNOC), which made an aim at the beginning of 2017 to soon reach 20 stations. These initiatives come as part of many sustainability initiatives being taken by the historically oil-dependant nation, which now has aims of being a world leader in sustainability. However, like with any new societal movement, that requires more than just government initiatives. Enter 2017, the year for electric vehicles to shine in the UAE. In just a few months, infrastructure across the country has more than doubled thanks to a number of people, organisations, and the government laying the foundations in providing incentives and further infrastructure plans. 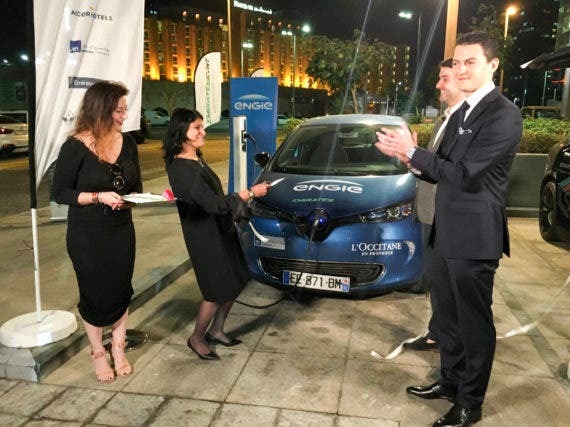 In January 2017, the company Global EVRT (which I’m a part of) celebrated the opening of 9 charging station points across the UAE (built by French energy company Engie) as part of its Emirates Electric Vehicle Road Trip. These included the first charging stations in the Emirates of Ras Al Khaimah and Fujairah. The road trip saw 13 electric vehicles drive through all 7 Emirates, a feat that was not previously possible since charging stations had only been available in Dubai and Abu Dhabi. Around the same time, the pioneering development of The Sustainable City in Dubai, a housing and commercial project by Diamond Developers, opened its charging stations for public use. The Sustainable City sets a wonderful example of how communities could look when sustainability is at the core of their development. Petrol and diesel cars are only allowed on the perimeters of the complex abiding to their “EV only” rule within the community. There are electric buggies shared by residents for transport, an electric vehicle concierge service for visitors, food deliveries by bike, and even electric “police” buggies for security. It is a peacefully quiet and fume-free window into our future, and proof that it’s achievable today. Two weeks after Global EVRT completed the first and longest electric vehicle road trip in the Middle East, Elon Musk landed in Dubai and announced that Tesla was on its way (a month after CleanTechnica picked up that scoop). The great work of the government, local business initiatives, and early EV adopters in the country had been noticed, and as Tesla does, it was coming to help speed things up. Just a few months later and there are now over 30 Tesla charging stations in the UAE, across Abu Dhabi, Dubai, and Ras Al Khaimah, with more scheduled to be built by the end of the year, including in more inland parts of the UAE. DEWA has since continued to install charging stations across Dubai, bringing its number up to around 100, and they plan to install a further 84 charging stations across Dubai by the end of the year to reach its phase 2 goal of the Green Charger Initiative of having 200 charging stations. In September, the Dubai Supreme Council of Energy announced game-changing incentives for people to buy electric vehicles. So, now that the infrastructure is here (and growing), the initiatives are here, Elon Musk came to visit, why are we not seeing a Tesla on every street or a Nissan LEAF in every queue for the mall? The next challenge facing the UAE in its move to electric vehicles is that the car manufacturers are not all here yet! Tesla is here, with a showcasing room in Dubai, and is rumoured to have sold around 400 cars already. Renault has its first model of the Zoe electric car here (200 km range), with two showcasing rooms in Dubai and one in Sharjah, but is still set to launch its new range Zoe (400 km range), expected at the end of October. BMW has its hybrid i8 car here, but not yet its fully electric i3, and whilst there are rumours that Nissan will enter the market with its fully electric LEAF, nothing concrete has been announced. The UAE is ready for electric vehicles, with Dubai leading the way and making one of the quickest developments in electric vehicle initiatives and infrastructure seen across the world. With 50 Tesla vehicles now amongst the Dubai Taxi Corporation’s fleet, which can be ordered through the Uber app, and the newly named “Virgin Hyperloop” (after heavy investment from Virgin) underway, this is a country to watch for innovative and sustainable transport.